There is just something so inexplicably attractive about Truc Vert that draws me back time and time again. A delicatessen by day where hordes of lunchtime crowds flock in to purchase goodies such as quiches, salads and scrumptious cakes, in the evening it transforms itself into a quaint and charming French restaurant with white tablecloths and tealight candles. So what makes it so inexplicably attractive? The place has charm and warmth and it’s hard to miss from the moment you walk past its windows, peering into the restaurant as you do so, before eventually making your way over the threshold. It has a feel of a warm country cottage with its wooden furnishings and wooden floors and the simple touch of comforting paintings dotted throughout the room. It’s unpretentious and a seemingly safe haven from the throngs of shoppers that populate Oxford Street. From the daily changing menu, the food is solid, competent fare, with few frills, but extremely tasty all the same. The ingredients are always fresh and wholesome, the dinner portion sizes satisfying, and all round the standard of the food is enough to make you think that £18 for two courses and £22.50 for three courses from the prix fixe menu, which is available between 6pm to 7:30pm, is truly great value. And there are a reasonable number of choices on the menu too, with five options for both starters and mains. For even more variety, there is also the a la carte menu where starters are priced at about £6 to £10 and mains at £15 to £18. On this visit, I settled on a sautéed squid with Thai style vegetables, bok choy, egg noodles and soy and spring onion sauce from the prix fixe menu. For a starter, the portions were overwhelming generous. 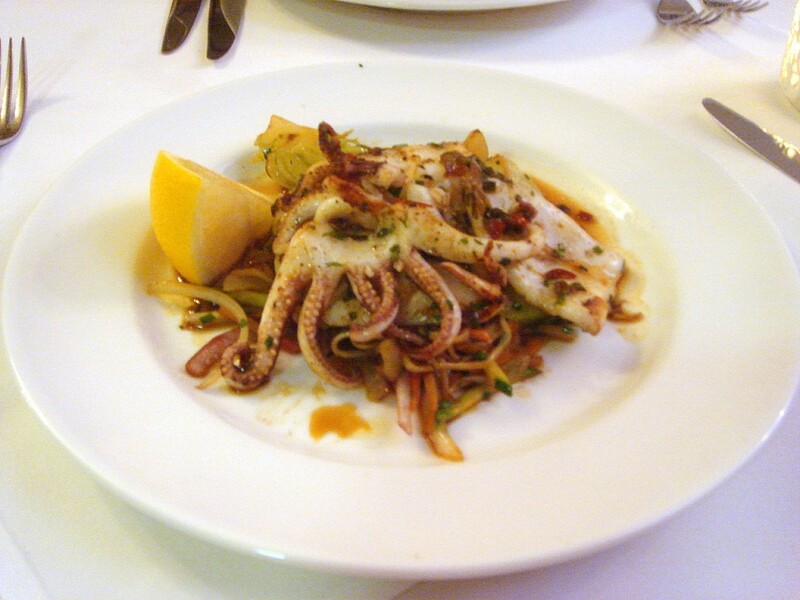 The squid was exquisitely tender although the vegetables were overpowered by too much soy sauce. 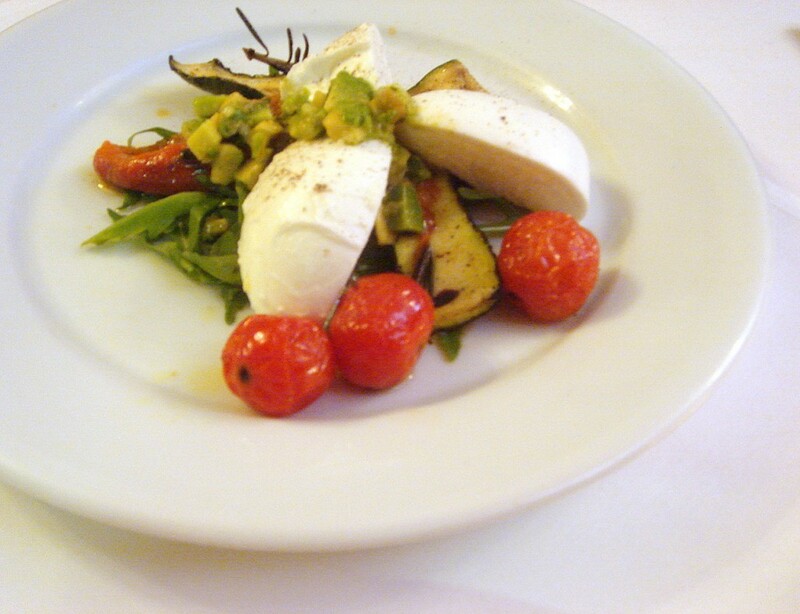 Another generous portion of buffalo mozzarella starter with grilled marinated courgette, mixed peppers, cherry tomato, mixed salad and avocado salsa was just right, with beautifully tender pieces of creamy mozzarella. 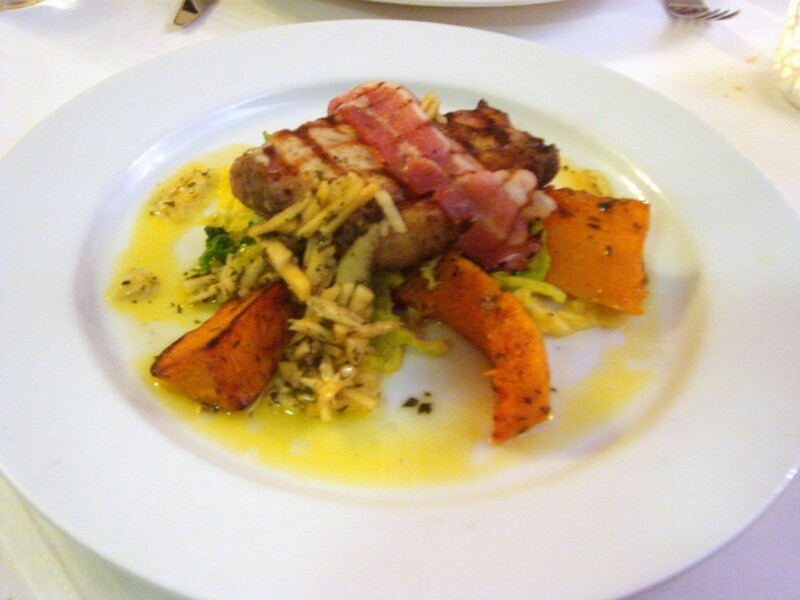 A main of English pork loin steak with roast butternut squash, pancetta and apple came with a sautéed cabbage which was slightly underdone and in need of more moisture, but otherwise the pork was cooked perfectly and contrasted wonderfully with the soft subtle sweetness of the roast butternut squash. 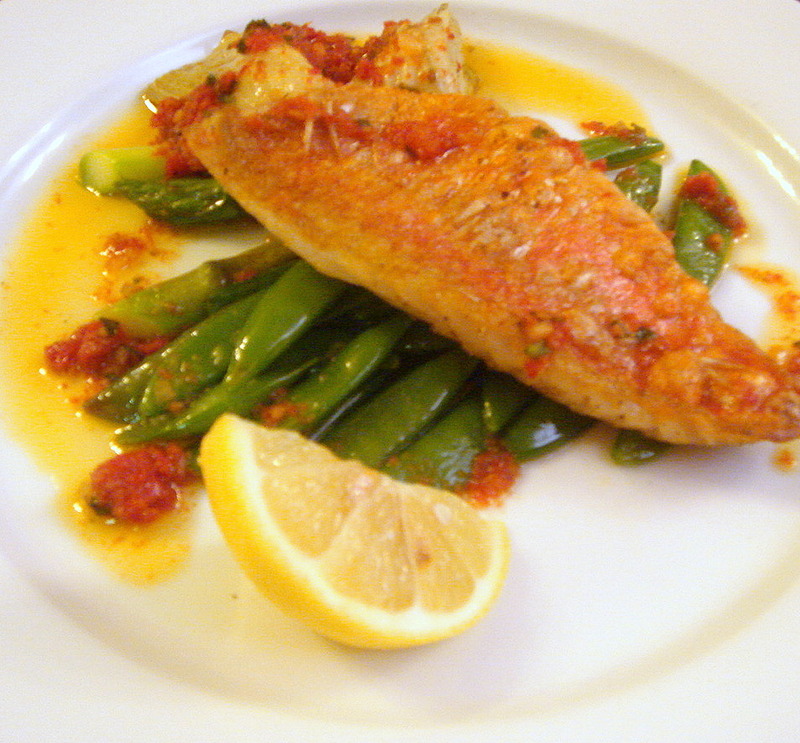 A seared red mullet fillet with braised fennel, sugarsnaps, asparagus and semi-dried tomato dressing turned out to be a juicy, tender, flavoursome piece of fish with lovely accompaniments. We didn’t order any sides, but from looking at the deep fried courgette (£3.50) and chunky chips (£2.50) ordered by a table close by, they were served in huge bowlfuls, probably big enough to be a meal on their own. We chose the desserts from the a la carte menu, which at about £4.95 each barely made a difference to choosing from the prix fixe menu. The apple pie, an individual pie rather than a slice, had a lovely crumbly pastry and a warm centre of sweetly caramelised apple. Another starter of Truc Vert baba au rum, a baked panettone where one then splashes syrup and rum onto the baba at the table, was a little dry. But such is the generous spirit of the restaurant that I was left the entire bottle of rum to do the splashing myself. If the waiter had brought me some coke and ice, I would have been even more content thank you very much. On other drinks of an alcoholic nature, the wine list runs about four pages long and includes both old world and new world wines around the £20 to £30 mark. In fact, Truc Vert, also hosts occasional wine tasting evenings. Service was lovely. It was unpretentious and came delivered with smiles and gentle ease. And to top it all off the discretionary service charge is only 10% rather than 12.5%. Yes there is just something so inexplicably attractive about Truc Vert that I will be sure to go again. Approximate price bracket – £22.50 for the three course pre-fixe menu which is available between 6-7.30pm. Otherwise – £25 to £35 (based on three courses). Excludes drinks and a 10% service.